Edo, later renamed Tokyo, became the political, economic and cultural center of Japan, an honor the city has enjoyed for 400 years. The metropolis continues to grow today. How did the city develop, and what would life have been like there in days gone by? Seventeenth century illustrations and maps show that Edo was a huge city, measuring 43.9 km² in area. At the time, it was bigger than Rome, the largest city in Europe (14.6 km² ), and far bigger than London (9.2 km² ). Edo occupied so much land because it developed according to an urban plan that called for moats to extend from the castle in a clockwise spiral, taking advantage of topographical features such as rivers, valleys and hills. With the civil engineering techniques available at the time, there were few limits to the city's expansion. The city sprang up there partly because Edo Castle already existed. Tokugawa Ieyasu (1542-1616) established himself in the castle in 1590. The castle was well known, having been built by Ota Dokan (1432-1486), and the plan was that Ieyasu would use it as the headquarters for his Shogunate at Edo. But when Ieyasu set up residence there, it was realized that the castle had fallen into terrible disrepair. Instead of stone walls, the defense works around the castle were only grassy embankments, and the manor inside them was no better than a farmhouse. A new plan was therefore drawn up to greatly expand and strengthen the castle. Edo Castle and the city of Edo developed in four distinct phases. The first phase extended from 1590 to 1602. During this construction period, Ieyasu made Edo into the political center of eastern Japan. The old castle built by Ota Dokan had three enclosures surrounded by earthworks. Ieyasu chose one of these as the site for his hon-maru, the enclosure that would serve as the castle's core area. It is assumed that the other two enclosures became secondary areas called ni-no-maru. The old dry moat around this base was filled in to increase the area available for enclosures, and an outer moat was dug to expand the defense works. A western enclosure (nishi-no-maru) was also added at this time. Work came to a halt when Toyotomi Hideyoshi (1536-1598), who controlled all of Japan from his base in Osaka Castle, ordered the construction of Fushimi Castle. The second phase lasted from 1603 to 1616. From the time Ieyasu became Shogun, and until his death in 1616, Edo developed rapidly into the political capital of Japan. A massive urban plan was announced for the construction of the city and digging of a canal (called Dosan-bori) from the bay to the castle. The canal became a vital water transportation route to the castle, and made it possible for stone, timber and other material and goods to be brought there by boat from more than a hundred kilometers away. Vast supplies of construction materials were transported in that way. The land along both sides of the canal was crowded with goods. It was a veritable beehive of activity, with marine transport ventures, lumber shops, markets and more. This area became the center of construction for the new city. At Edo Castle, the Shogun's residence and the main tower were built in the hon-maru enclosure, and the nishi-no-maru enclosure was reinforced. The main tower rose 44.3.meters  five levels outside, seven stories inside. The castle was designed for war, unlike later castles built during the long period of peace that followed. The third phase stretched from 1619 to 1632. After Ieyasu's death, the second Shogun, Tokugawa Hidetada, initiated an urban development plan to expand the city in a clockwise spiral centering on the castle. This involved removing earth from the Kanda-dai hilly area, changing the course of the Hira River so that it joined the Sumida River, and reinforcing defenses at the northeastern part of the castle. Earth taken from Kanda-dai was used to reclaim land in the estuary that had stretched to the foot of the castle. This permitted the city to expand southeast of the castle. Residences for daimyo lords were built on reclaimed land near the castle, and land further away was used for housing for commoners. Massive stone walls were completed from the north side of the castle to its main entrance on the eastern side. During the same period, the main tower was moved to its final place. The tower had a completely new design  the exterior was given a black lacquer finish and had five levels, and the interior structure above the stone substructure had the same number of stories. The height of the tower above the substructure was 44.8.meters, only a little higher than the tower built in the second phase. A residence was built in the ni-no-maru enclosure, and a formal garden was laid out. The fourth phase was from 1633 to 1651. 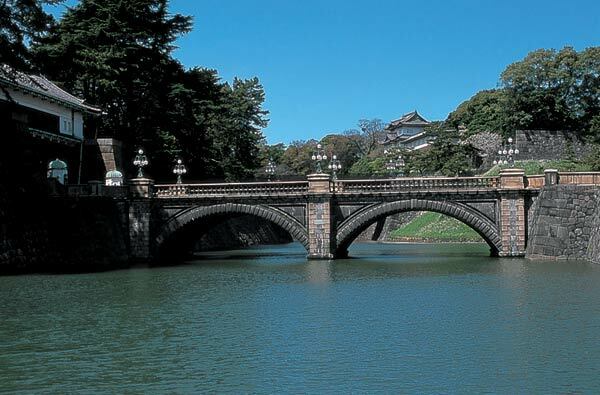 The third Shogun, Tokugawa Iemitsu, had a moat dug northwest of the castle, from Tameike through Ichigaya to Koishikawa. As a result, the moat system, centered on the castle and forming a clockwise spiral, connected with the Sumida River and Edo Minato (Tokyo Bay), and eventually surrounded the city. A residence was built in the hon-maru enclosure and a large substructure for the main tower was completed, together with an attached substructure for a smaller watchtower. The exterior of the main tower had five levels, and the interior had five stories above the stone substructure, reaching to practically the same height as the main tower built during the third phase. A cellar was constructed inside. The main tower soared high and appeared to confront viewers from all directions equally. It could be seen from everywhere in the surrounding urban area, and became a symbol of the Tokugawa Shogunate. However, the main tower was lost to fire in 1657 and never rebuilt. It was the planned clockwise spiral of moats that became a symbol  horizontal, rather than vertical  of the Shogun's awesome power. After the Meiji Restoration of 1868, the city began a new era under the name of Tokyo, and has continued to expand to the present day.